The sage blooms in May. Year after year, like the eternal clock of the universe . . . invariably, the sage blooms in May. Brilliant white stalks reaching skyward through dense and dusty leaves toward the leaden May rain clouds. However, as with all of life's familiar and comforting rhythms, that gentle cadence on which we come to rely, the sage bloom was delayed by a hard and very long winter. It's June now, and the blossoms in my garden are just beginning to open, reaching, this year, toward the brilliant summer sun. Perhaps because of the icy winter which nearly killed my humble sage, or perhaps because of the heat which bakes the flowers through the long afternoon, the blossoms are especially sweet this year. Like floral honey, they burst in your mouth, an unexpected surprise from a plant that's known for its earthy, musty aromas. I savour the days when the sage is in bloom, as it signals the start of summer. What a happy coincidence that the sage is blooming just as peach season begins! For this reason I felt compelled to combine the two in a crisp and rustic galette. As I toyed with the recipe in my mind, I debated sweetening it with agave nectar, brown sugar, or most desperately, honey. But, as I tested combinations I was reminded of these famous words: In the grand opera of cooking, sage represents an easily offended and capricious prima donna. It likes to have the stage almost to itself. Therefore, I decided to keep the flavors simple, let the prima donna shine like the sun in June. I, however, couldn't get the thought of honey out of my mind. Like a song stuck in your head until you can stand it no longer and belt out the words at the top of your lungs, just to get some relief. It haunted me. I had to use honey somewhere, the delicate sweetness of the sage flowers required it. 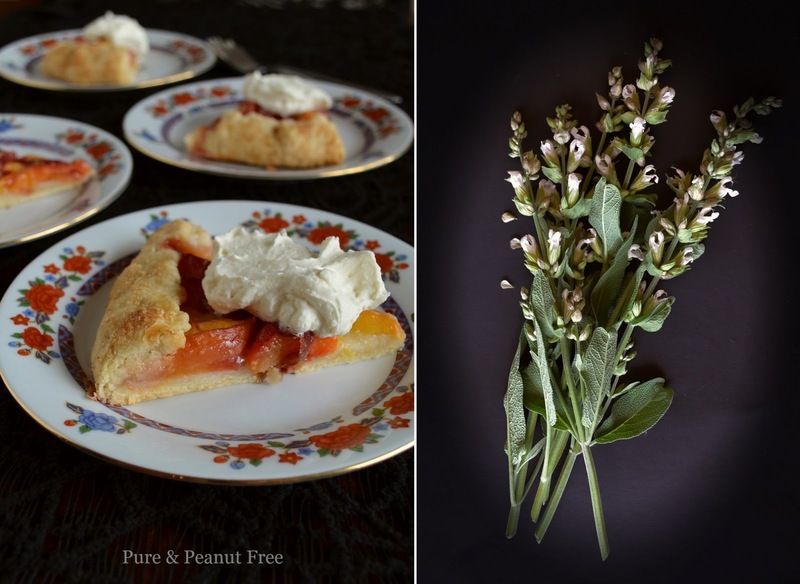 I decided to make a honey sweetened mascarpone cream to top it off (Merci to Mimi Thorisson of Manger and this ethereal post for giving me the idea!). The perfect compliment. If you don't happen to have a sage plant in full bloom growing in your back garden, don't worry, you can certainly make the peach galette without it, and it will still be absolutely decadent in its simplicity. Just be sure to make the mascarpone cream. It's the icing on the cake, so to speak, and I promise, you'll never make whipped cream the same again. Make the dough by combining the flour, sugar, and salt in a large bowl. Using a pastry blender (or working quickly with your hands), cut the cold butter into the flour until it's the size of small peas. Mix in the water a few teaspoonfuls at a time until the dough just starts to come together. Turn it out onto a clean, floured surface. Using the heel of your hand push sections of the dough across the board, smearing the butter into the flour. This technique is called frissage, and is used to create thin layers of butter running throughout the dough, which makes for a flaky crust. Gather the dough into a ball and frissage again until the dough just comes together. Pat the dough into a disk and wrap in plastic. Refrigerate for one hour. Meanwhile, clean your sage flowers by filling a large bowl with water and swishing the flower stalks vigorously in the water. This cleans off any dirt and excess pollen, as well as dislodges any insects that may be hiding in the flowers. Lay the flowers on paper towels to dry. Pull the flowers from the stem, and remove the stamen and pistil from inside the bloom (this further removes pollen that could possibly cause an allergic reaction in some people). After the dough has been in the refrigerator for one hour, preheat your oven to 400 F (200 C). Combine the sliced peaches, sugar and cornstarch. Roll out the dough into a 12 inch round on a piece of large parchment paper. Carefully transfer the dough and the parchment paper to a baking sheet. 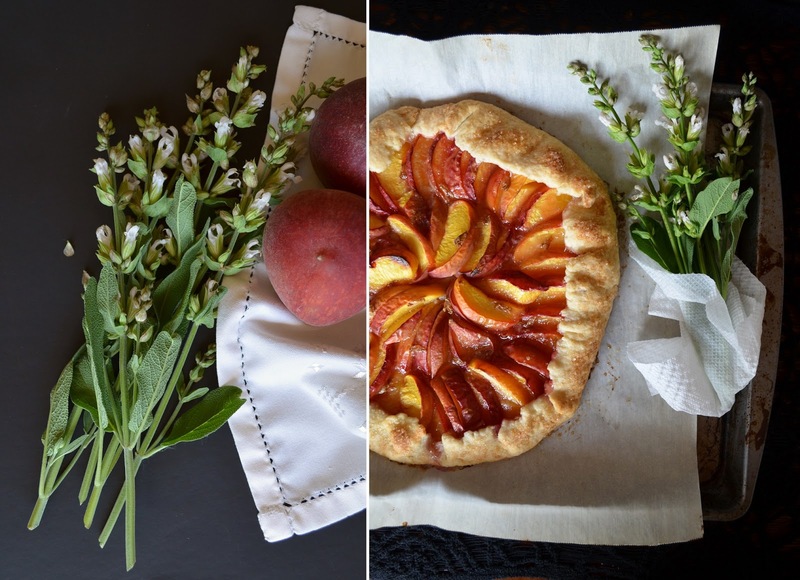 Scatter the sage flowers on the dough, and arrange the peaches in a neat circle over the flowers leaving a 1.5 inch border. Pour the remaining juice over top. 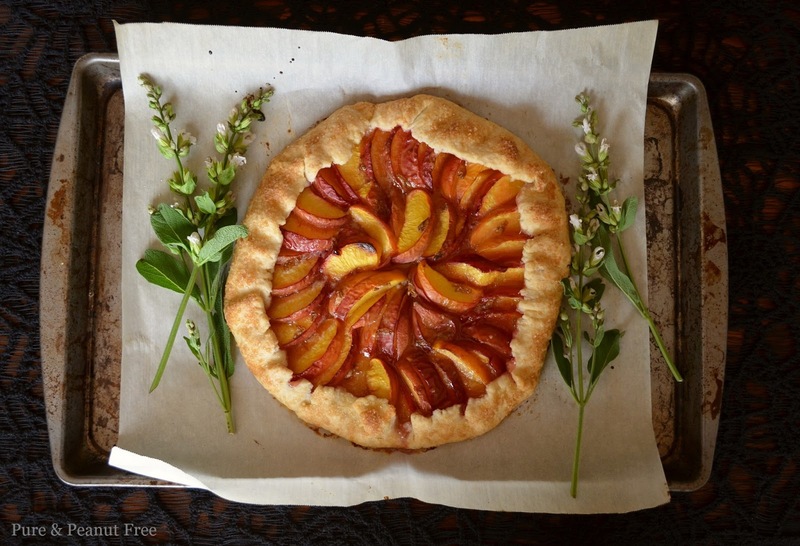 (I draw an outline in the shape of a circle on the dough with my fingernail to make sure I arrange the peaches evenly.) 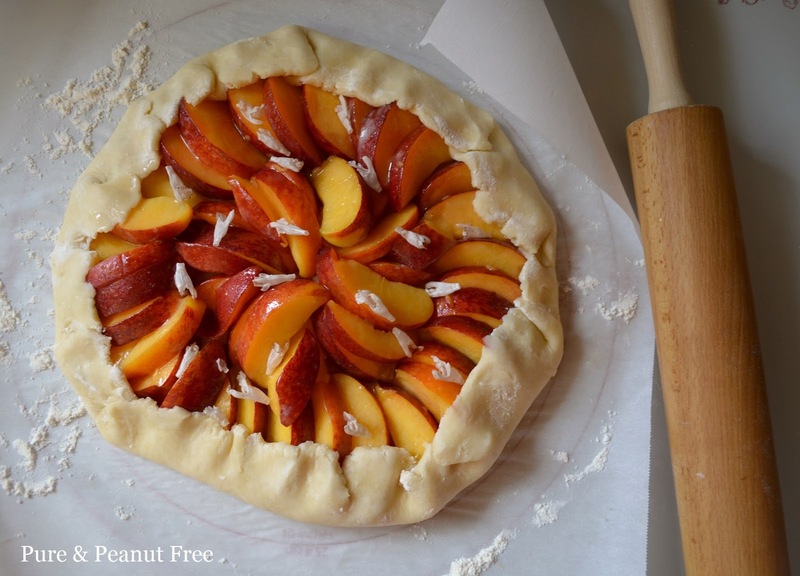 Fold the edges of the dough up around the peaches crimping it every few inches. 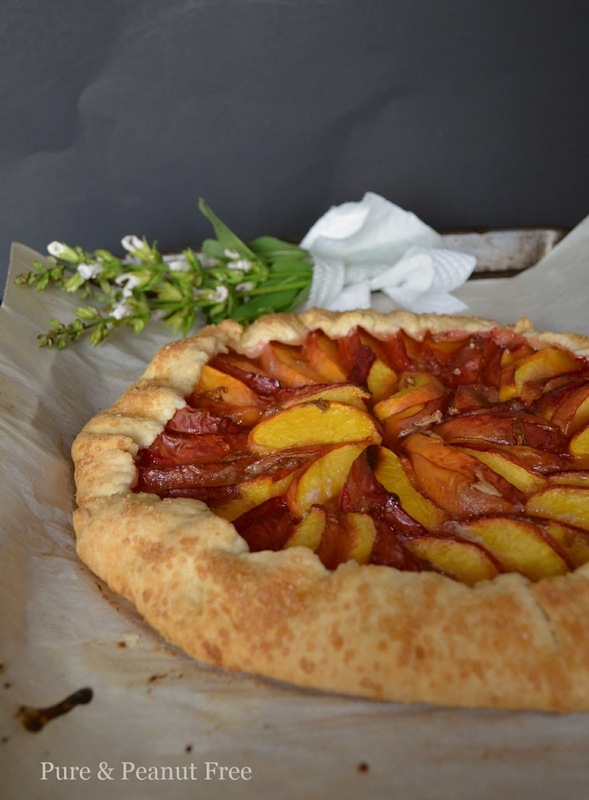 Melt 1 tablespoon of butter and brush the edges of the galette. Sprinkle the edges with coarse turbinado sugar. Dot the peaches with the remaining tablespoon of butter. Bake in the preheated oven for 45 - 50 minutes until the crust is golden brown. Serve warm or at room temperature with honey-mascarpone cream. Sage is my favorite flavorful flower of all time! It adds such an aroma to food, its amazing! I spend a hefty amount of money to grow it in my garden, so this recipe is perfect for me! Thank you for sharing.